Next we drove to Rockport Beach, a peninsula of land comprising mainly carparks and sandy beaches. Our first stop was just past the entrance hut where a few birds sat on the water's edge – two each of Royal, Caspian and Sandwich Tern, a few Sanderling, our first Wilson's Plover, two Semipalmated Plovers, one Least Sandpiper, lots of Laughing Gulls and a Mottled Duck on the water. 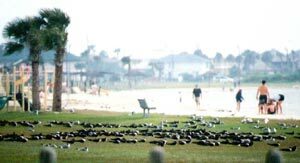 Further on we could see lots of birds in the distance sitting on the grass that we thought were gulls. They seemed unconcerned by the people walking past them on the beach. Earlier we had asked the leaders if we'd get Black Skimmer and they had just smiled. 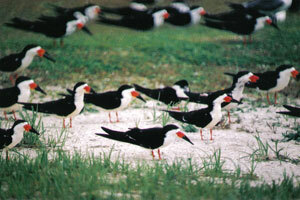 Now we found that the majority of the birds on the grass were Black Skimmers – about 400 of them! And they were happy to let people get quite close. On the water's edge were Ring-billed and Herring Gulls, plus Willets, while a Least Tern flew past. A Great Blue Heron flew over the water having had enough of the tourists on the beach. Looking out to sea we added three Gull-billed Terns, a male Bufflehead and a Brown Pelican. Further along the peninsula we found three Savannah Sparrows in deep grass, Snowy, Great and a single Reddish Egret and one Western Sandpiper. A flock of Laughing Gulls and Willets also included Ruddy Turnstone and a single American Golden-plover. Next we had a short but hot walk to an observation platform to view the island where the egrets and herons nested. We had almost got there when over the CB came the news that there was a Long-billed Curlew back over where we had just come from. We ran back and had good views of this very buff-coloured bird. Back again to check the nesting island we had a male Mallard (rare down here – might be feral! ), at least 14 Great Blue Herons, a Tricolored Heron, both white egrets, and a Reddish Egret. Near here was another sandy area where many birds nested – Royal, Caspian, Forster's and Sandwich Terns, Laughing Gulls and Wilson's Plover. Next stop was the south end of the bridge crossing from the Live Oak Peninsula to Lamar Peninsula. It was still hot and windy but we added a few more species. Savannah Sparrow was again seen plus a Killdeer doing its distraction display. Four American Oystercatchers fed and made a noise at the water's edge, a pair of Red-breasted Mergansers and a Common Loon were on the water and Barn and Northern Rough-winged Swallows were common overhead. A small island had more nesting terns and we saw, both on the island and flying around, Royal, Forster's and about five Least Terns. Two Black-bellied Whistling-ducks flew past as did Brown Pelican, Great Egret and five Redheads. A short stop for refreshment added a close Eastern Meadowlark and a single, winter-plumaged Long-billed Dowitcher (heavily scrutinized before we agreed on its identification). At the north end of the bridge we added Cliff Swallows, nesting under the bridge. The drive back to Victoria added yet more species: at various stops we had three male Northern Cardinals, lots of Mourning Doves, three Northern Caracaras (one being mobbed by a Scissor-tailed Flycatcher), 80+ Cattle Egrets, a female Northern Harrier, Eastern Meadowlark, TVs and three Loggerhead Shrikes. One stop added rather distant views of two White-tailed Hawks and we got another (again a quite distant bird) later. There were four of us who always carried our bins with us. Outside our restaurant for the evening we checked four birds on a telegraph pole and so added Bronzed Cowbird (two male, two female) to the trip list, and, with the loan of our bins, to many people's life lists.